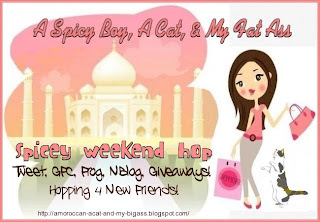 I have joined forces with my friend Jackie from Free Hot Samples, and we will be celebrating our weekend hopping together! **As a thank you for linking up! 7 blogs are picked every week (Using random.org) to be a Blog of the Day on Free Hot Samples facebook page. I will be doing this as well, starting for next week! Hey Kim! Thanks for making my blog your feature blog this week :) You don't know this, but . . . your blog introduced me to blog hops and got me started on this new obsession!